Perfect for me. It not heavy, but it keeps you warm. Enjoy the cozy warmth of down without the pricetag with this plush blanket. Crafted from soft, machine washable polyester, the blanket features cozy down alternative fill. 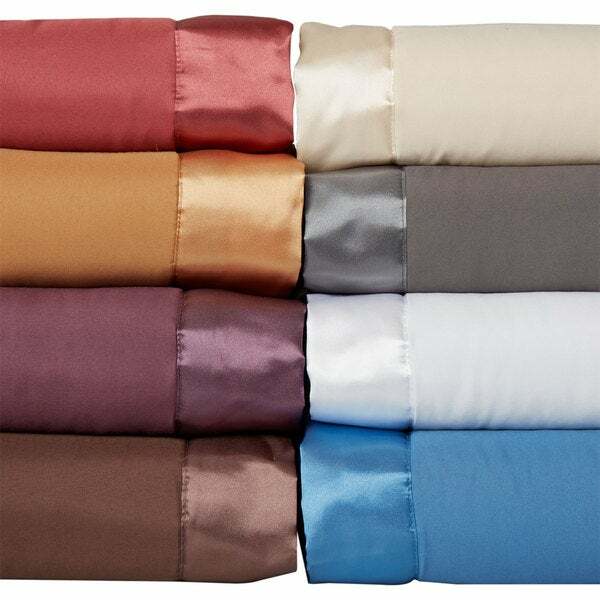 The blanket is available in a range of colors to match your decor, and the shimmering satin binding creates an elegant appeal. This is a nice blanket for summer months - lightweight, yet with enough warmth that my (frequently cold!) husband feels cozy. It washes and dries well. My only "complaint" is that the material, while soft & lovely, is a magnet for pet hair. It gets really static-y, so we have to lint-brush it each day with a damp lint brush in order to keep the fur off it. I used to buy a similar blanket from Overstock that had a different (not as soft, but still nice) material, and that was my dream-blanket in this regard. Blanket is lightweight and warm. It's not one of those over-stuffed comforter things. On a very cold night I need an additional blanket but this is just right for most nights. The material is very smooth and there is no bunching in the batting. Top stitching and satin trim are smooth and even. I have a queensize bed with a plush pillowtop (one side) mattress. I ordered a king blanket and it's perfect. Hangs down just a couple of inches over box springs. My husband and I are both on the "plus size" and there's enough blanket for both of us. And the price was amazing! Blankets are nice but the sizing of double (full bed/Queen is way too wide for a double bed with a large mattress even. The sides would hang way below a quilt. If a person had a older mattress would be no way you could cover the blanket. I think the sizes should stay as usual full size for the double bed and Queen size for the Queen bed. I bought 3 full/Queen and they all are too wide and I don't mean like 3"more like 12" and maybe more. The size just ruins the purchase so I thought maybe I could take it up down the middle. Love the colors and the quality. Excellent Blanket. We have purchased several of these in different colors. Durability and construction of this product is excellent. Lightweight and cozy blanket. FIVE STAR rating. I really like this blanket. I thought it would not be heavy enough because it feels so light weight. Our temperatures got down to just above freezing and it kept me nice and warm. I did read that someone said it was too wide. To me there is no such thing as a blanket that is too big. I ordered the size for my mattress and it is fine. I really like the satin trim. This is a milk chocolate color/ It has boxed quilting on it so it is easy to make up the bed. Would recommend. This alternative down blanket is so cozy, but does not allow you to overheat. The color is beautiful. This blanket is wonderful! There are two things that make this blanket special. The quality of the satin is one. The other is the way it washes. I have washed it several times and it comes out just like new! It is very warm an light weight at the same time. I have bought many blankets raising my three children. The quality and value of this blanket should have been available when I was raising the children! I have spent much more for a lot less quality. 60 year old retired RN. I LOVE THIS BLANKET! I LOVE THE COLOR AND IT'S SO COZY! I bought this blanket for the color which matches our decor well. I would have preferred a down filling, but will see how. Like this alternative material. This blanket is .made really well. The stitching is very tight so it wont unravel easily. The satin trim is Extra Nice & wide. Appears very expensive at an affordable price. Will try to order another one. So small a king size barely covered a queen size bed. Love this blanket. Not too warm, and I don't have the weight of multiple blankets. Perfect for Wisconsin winter. Got this for my sis without her final confirmation so was apprehensive. She can be scathing (;-) though hates doing her own shopping. The plum color is quite lovely and worked with the variegated lavender, gray, yellow shades of her bedroom. It is also genuinely light, which makes layering for temperature easy. Success. No scathing. These blankets have a great combination of thickness and softness. They launder very well. This is an amazingly luxurious blanket for the money. It washes well and maintains its soft feel. Will definitely purchase another one for my bed and for my guest bedroom as well. You will love this blanket! This blanket is a good weight and very nice feeling. I used it on a queen sized bed and it fit well. Excellent choice fits like a glove on the bed. My bed always looks beautiful. it was just the right color I was looking for. Very easy to wash and dry. during the summer I don't need another blanket. I don't even have to put a blanket over it. This is a good quality blanket, it's used everyday on our bed and has held up nicely through washings.
" Is the gold color more orange than gold? Thank you "
Mine looks like an antique gold. It is more of an Ochra or 1970's "Harvest Gold" _ I do not love the color but the blanket is fantastic! Not too hot or heavy and stays in place making the bed easy to make. It also washes up well. "Does the satin binding go all the way around the blanket or is it just on one or two edges?" The satin binding goes around all four edges of the blanket. I love purple (violet seems to be a very close color) and two of my girlfriends have this type of blanket and it is so light yet so warm that I'm treating myself to an early Christmas present! I also thought the price was something I can afford. Need new Ksz blanket and the price was great! !